I recently watched two very moving documentaries about the last miners in Britain’s last deep coal mine, Kellingley, which closed a year ago. Their bravery, camaraderie, solidarity and dedication were inspirational. One of the miners said that they knew that coal use could not go on for ever, but there was grief and bitterness that mine workers were being thrown aside, unmourned victims of global political decision-making. For those of you who have access to BBC i-player, I strongly recommend that you watch these programmes. One of the issues that has continually struck me in my years of work on Colombia’s Cerrejon coal mine is that the opening of this huge opencast coal mine (now owned by three mining companies listed on the London Stock Exchange) helped enable the British government to destroy the British deep coal mining industry in the 1980s. People in Britain who wanted to continue mining coal were prevented from doing so, and British communities built around coal were devastated, while farming and fishing communities in Colombia who did not want a coal mine had one forced upon them, with dire consequences. Deep coal mines generally employ many more people per tonne of mineral produced than opencast mines, and their ecological footprint is considerably smaller. Much of the coal burnt in British power stations now comes from opencast mines in Colombia and Russia at enormous human and ecological cost. 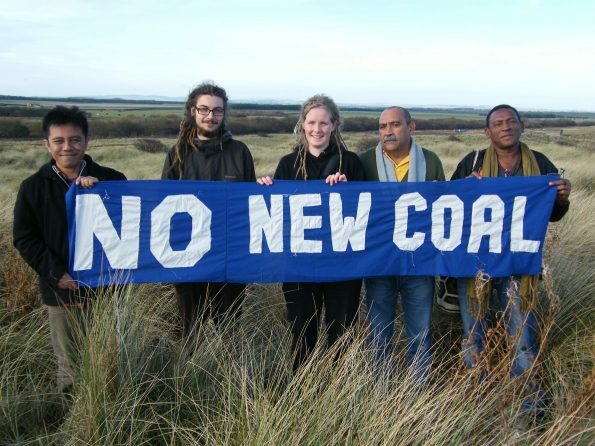 In Britain, coal mining companies are still attempting to construct new opencast mines and facing huge opposition, including from former deep coal miners. The UK Government is conducting a consultation on the phasing out of coal use in Britain, a process which LMN member group Coal Action Network believes to be much too slow. With fellow LMN member group Biofuelwatch it has produced a helpful briefing. We have to stop using coal if we are to avert climate catastrophe. And in case anyone should think that uranium is somehow more benign than coal, read Why worry about nuclear waste? What has the future ever done for us? about the legacy of deadly radioactive waste that we are unjustly bequeathing to our descendants. Most of us at LMN believe we have to minimise all kinds of mining. We need to reuse and recycle metals as much as possible and ensure that good design enables more rational use. We have to cut energy use and ensure that the energy we do use is much more efficiently used. The mining industry is enormously destructive, full of corruption, and its critics around the world are subjected to all kinds of violence and harassment. At LMN we honour and support many who are working to stop the world’s mining frontiers advancing, among them African women resisting coal, oil and uranium, whom you can assist in making a film. But there has been much news recently about job losses in the mining industry and their terrible impacts on mine workers and their communities. We have to find ways of halting destructive mining projects while ensuring that mine workers and their communities are not treated like waste material. They also deserve our respect and our solidarity. We need to stand with our friends in global mine workers’ union IndustriALL in their work towards a Just Transition. Meanwhile, why not take action by taking part in a lively protest on 15 December against GCM Resources and its outrageous opencast coal project in Bangladesh. I hope to see you there!